I hope everyone had a good Jazz & Rib Fest weekend despite the weather – I managed to enjoy great sets by Safety Squad and the Doug Neel 5tet Friday afternoon. This weekend’s Outdoor Jazz schedule (all events are free unless otherwise noted) gets off to an early start on Friday, July 27th thanks to the Lancaster Festival, with Detroit-based vocalist Ed Sterling Stone performing a smooth jazz set with his quartet at Veteran’s Park on Zane Square in Lancaster at noon (more details here). There are three great 6pm options for enjoying live jazz with your happy hour: the vibraphone and guitar Dylan Bram and Gabe Koempel Duo returns to the patio at Oscar’s of Dublin, Just Jazz Live Duo entertains with classic vocal jazz at Cimi’s Bistro (Grove City), and the Campus Gateway Beer Garden (outside World of Beer) presents The WS Collective in the next installment of their Local ‘n Live series. Keep reading for more great outdoor jazz this weekend and much more! The bustling outdoor jazz schedule for Saturday, July 28th gets going at 9:30am with the always entertaining and rotating lineup of vocalist Anna Paolucci’s Strings n Tings at the Clintonville Farmers’ Market. The NiNi Love JazzySide Summer Jam runs from 1 to 7pm at Mt. Vernon Plaza in King-Lincoln Bronzeville, with a lineup that includes the William Brady Project Band at 4pm and NiNi Love JazzySide at 6pm. The evening heats up with two soulful 6pm shows: the finale of the Jazz in the Park series at Maloney Park in Linden features vocalist Adria Shahid backed by E-Flat and backup vocalists including Tia Harris and Vicki Saunders, and keyboardist Vernon Hairston will perform jazz and neo soul with vocalist Chin on the Autumn Rush Vineyard patio in Johnstown. Also at 6pm, the Local ‘n Live series at the Campus Gateway Beer Garden continues with jazzy “world music ensemble” Les Twelve Hips, featuring saxophonist Will England. And at 6:30pm, the latest sizzling installment of the 2018 Westerville Jazz At The Amp Concert Series presents smooth jazz saxophonist Eric Darius with Columbus’ own NexLevel at the Alum Creek Park Amphitheater. Finally, on Sunday, July 29th at 4pm, end your weekend with the next great event from the inaugural Bexley Jazz in the Park series with a performance by Spectrum, Capital University’s Jazz Studies Faculty Group, at Havenwood Park. Hang on to summer while it lasts! Friday, July 27th (9pm – 12:30am): New Basics Brass Band at Sonny’s on Broadway, Granville. This new music venue has been open in Granville for two months now, and serves the Donato’s Pizza menu. While standard musical fare runs between folk, blues, rock and cover bands, they have a funky jazz weekend ahead! 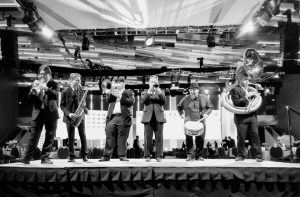 New Basics, Columbus’ own 20+ year tradition in New Orleans brass band jazz, will give visitors a funky good time while they enjoy their night out. Cover is $10. And if you can’t make it Friday, the high-powered trio lineup of fo/mo/deep plays Saturday (no cover), so stop by Sonny’s for a fun and funky jazz night out this weekend! Sunday, July 29th (6 – 8pm): Bobby Floyd Showcase: Tony Monaco with the Bobby Floyd Trio at Notes. As a busy July that included two weeks at Jamey Aebersold’s jazz camp in Louisville, a CJO feature and much more wraps up, Floyd shows no signs of slowing down as his Sunday Showcase at Notes keeps on swinging! A schedule shift has presented an unbelievable two keyboard lineup: Organ maestro Monaco will join Floyd on piano for a two-tiered keyboard attack! Floyd’s previous organ/piano shows have included switching instruments, so expect the unexpected. The concert ends with a jam session. Tickets are available here for this special event. Wednesday, August 1st (9 – 11:30pm): Antuan Walker’s Open Mic Jam at The Idle-A-While Supper Club, East Side. There is news of another new jam session this week! Starting as this article goes to press, the Open Mic Jam session at the Idle-A-While is open to all genres, but keyboardist Walker and house band Rhythmic Fusion will start things off in a jazz bent. Walker has toured with national acts of diverse genres and has recorded with numerous national artists, and just returned from touring with Angie Stone. He will be featured extensively at the Idle-A-While – stay tuned for our interview – often in his modern fusion style that is recommended for fans of Snarky Puppy. Grab your horn – signup starts at 8pm – or just drop by for great music with no cover! Walker also leads Rhythmic Fusion on Saturday and Sunday at the club (visit their Facebook page for more info), so check out one of the area’s top talents sometime soon!